Call for Price & Availability! If you are looking to reduce labor and equipment costs on your next job site, or just need the best in seed bed prep attachments, a genuine Harley Rake Attachment for your tractor, skid steer, or walk behind power rake is the all around industry leader in power rake equipment! Harley Rake, Mini Skid Steer Power Box Rake M.4H 48 Hydraulic Angle. 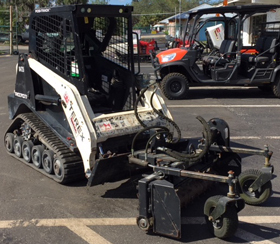 Harley M4 works hard in tight areas – excels with maneuverable Mini Skid-Steer. The Harley rake for mini-skid steers is the perfect unit to offer great maneuverability with minimal turf damage when repairing trenches or landscaping. 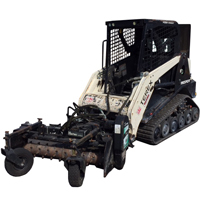 Landscape like the full-size skid steers in tight spaces where maneuverability is a must. The Harley mini-skid steer rake can till and mill the soil with its pure carbide teeth, creating a granular seedbed with a dimpled subsurface for a perfect seedbed and lawn. Features Low-profile frame offers excellent visibility. Rhino-Hide barrier controls particle size and speeds the drying of wet areas. Two position end plates allow you to rake up close to sidewalks or foundations. Applications Back-fill trenches Perfect for renovation of turf for reseeding Recondition infield mixes Great for de-thatching existing turf.